The “Locals and Legends” mural can be found on the corner of A. Philip Randolph Boulevard and Pippin Street. The side of the Man Cave Barbershop building on the corner of A. Philip Randolph Boulevard and Pippin Street is covered with a geometric design of vivid colors, with seven faces painted over it. It’s called the “Locals and Legends” mural and one of two new art pieces in the area. The Jacksonville Cultural Development Corporation nonprofit is the organization behind them, and its Executive Director Suzanne Pickett said they’re meant to be more than just pretty pictures, and there are more of them to come. Pickett said the people depicted in the “Locals and Legends” piece are important to the Eastside. “So this is A.L Lewis, the president of the (Afro- American) Life Insurance Company, and he also started American Beach,” Pickett said pointing to the face closest to her. American Beach was a Nassau County vacation spot for African-Americans during segregation. She went down the line listing the other important painted local faces including, James Weldon Johnson, author Zora Neale Hurston, Asa Phillip Randolph, Bob Hayes, Clarence Williams, who once owned the building he’s painted on, and Pearlie Graham, a long-time owner of nearby Spot Rite Cleaners. “She is our only living legend,” Pickett said of Graham. And down the street there’s another mural in progress depicting an old school in Jacksonville for African-American girls. Pickett said the historical scenes are intentional, and locals even help paint the pieces because community buy-in is important when transforming a community, she said. 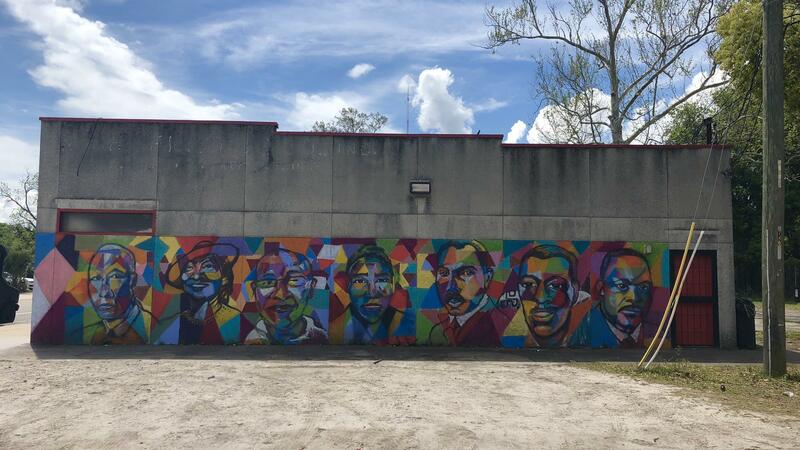 The "Locals and Legends" mural is located at the intersection of A. Philip Randolph Boulevard and Pippin Street. “A challenge in this community is that other organizations come in and they don’t reach out to the community and let them know what’s happening or what’s going on so it’s important to us to engage the community so they create a since of pride and they don’t feel left out,” she said. Pickett was one of three artists who created the “Locals and Legends” mural. Teens in the area who apprentice with the the nonprofit Groundwork Jacksonville and other community members painted the colorful background. Pickett said there’s a perception of the Eastside area, which sits between the sports-entertainment district, Springfield and downtown, as being vacant and crime-ridden. 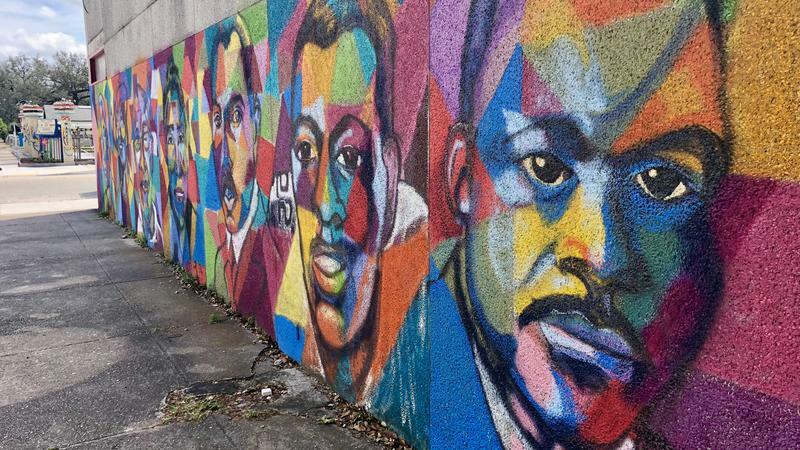 “Our ultimate goal to create enough murals to create a mural tour because there’s rich history on the Eastside and then you create tourism by which you bring development into the neighborhood,” Pickett said. She said one reason the “Locals and Legends” was placed on the side of the Man Cave Barbershop is because there are three other businesses in the building and she wanted that highlighted. Pickett said other entities like the University of North Florida are also considering murals in the area. 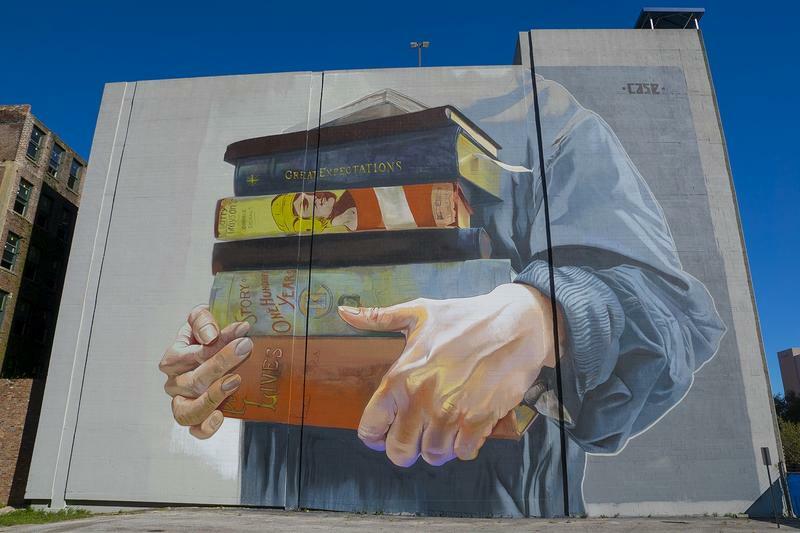 The “Locals and Legends” mural will be dedicated Friday at 11 a.m., as part of the Cultural Council’s Public Art Week. The ceremony will include a history of East Jacksonville, a reading of a Zora Neal Hurston poem and words from Pearlie Graham herself. 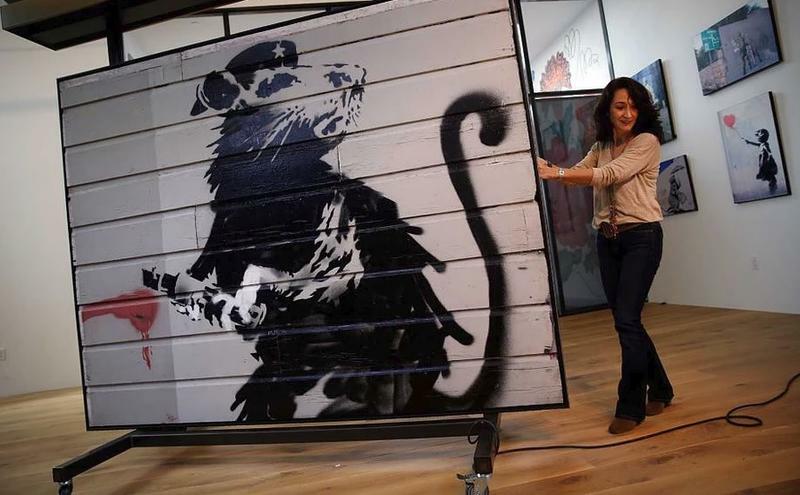 Anonymous street artist Banksy’s Haight Street Rat will be on display in the Jax Makerspace Gallery at the Jacksonville Main Library from Feb. 14 – April 14. At Jacksonville’s annual State of the Arts event Wednesday, the economics of culture took center stage as a new national study finds investing in artists is good business in Florida. African American author and folklorist Zora Neale Hurston is best known for her 1937 novel, Their Eyes Were Watching God.